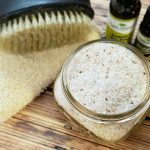 Do you want to learn how to make fun DIY beauty products for Christmas gifts? 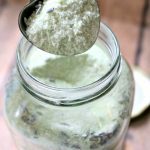 This all natural Pop Rocks Fizzing Bath Salts recipe is perfect for a fun DIY spa gift with an 80s theme! When I was a kid, I loved Pop Rocks candy. I loved how they would pop and fizz in your mouth! 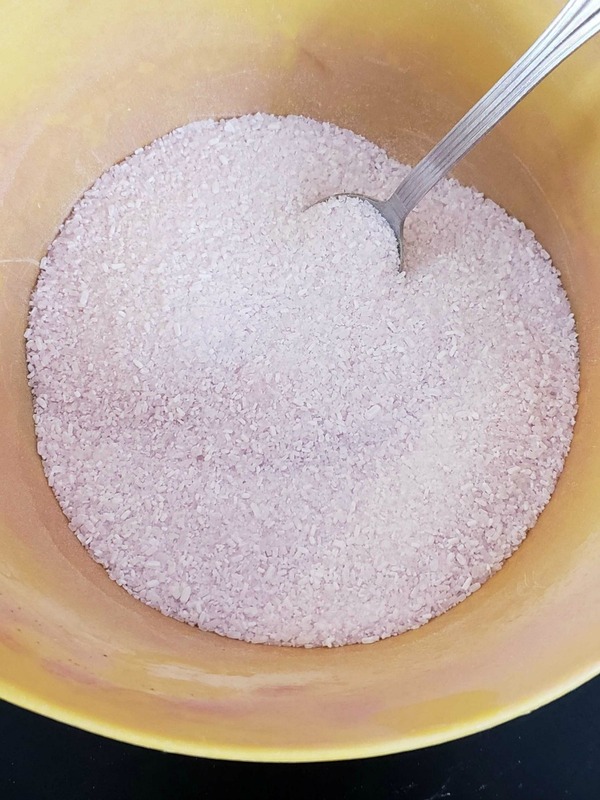 As I was reminiscing, I thought it would be really cool to make fizzing bath salts that looked like Pop Rocks, so I got to experimenting. I got out my DIY beauty supplies and wrote out a formula I thought might work based upon my experience. At first I thought this recipe was going to be a flop because it took forever to dry (as in days), but as it finally began to dry, I saw that my experiment was actually a success. The result of my experiment in making Pop Rocks Fizzing Bath Salts is pretty awesome if I do say so myself. 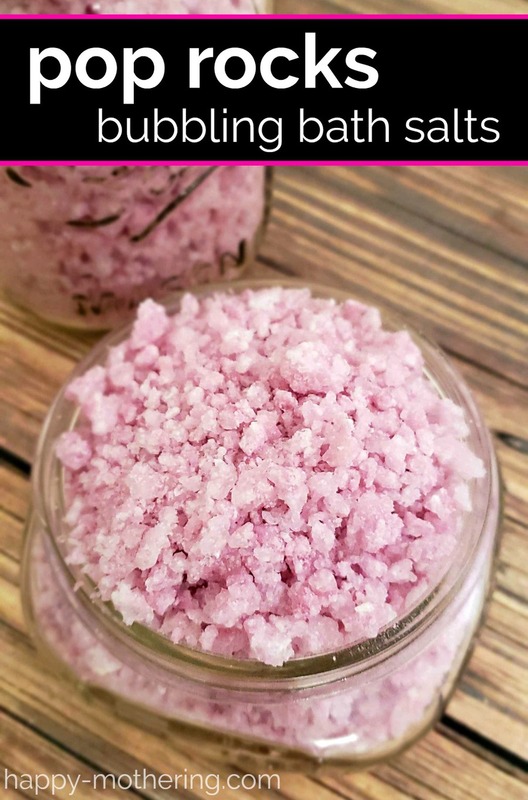 I know one question that will be asked is if you can bake this fizzing bath salts recipe on low heat to dry faster. I did experiment with that, and the fizzing action was greatly reduced when heat was used to assist drying. So I highly recommend air drying. I used a combination of 2/3 pink and 1/3 purple mica powder to create the pretty pink shade. If you’re looking for something with a deeper hue, more like the candy, you can use soap colorant instead. Keep in mind that mica does typically leave a ring in the tub and it can be slippery, so that may factor into your decision on which colorant to use. Of course, you could leave them white too and not use any colorant at all. 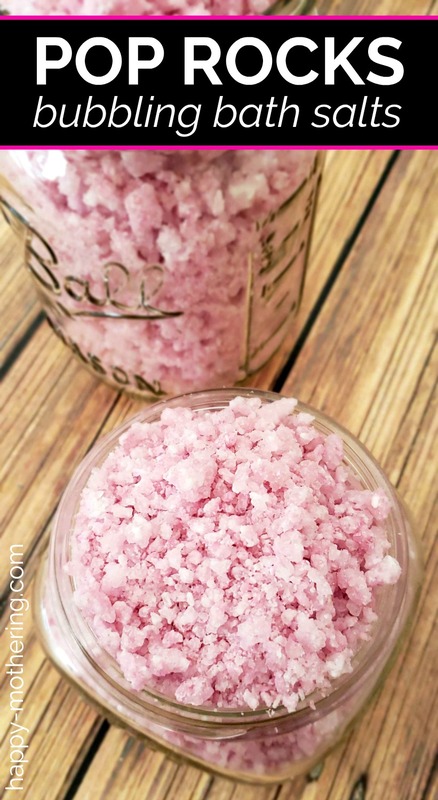 These Pop Rocks Fizzing Bath Salts would make the perfect gift for a child of the 80’s like me, or anyone who loves fun homemade beauty products. Put the epsom salt, baking soda and citric acid into a medium mixing bowl and stir until well combined. Add the mica powder, if using, to the mixing bowl until you’ve achieved your desired color. 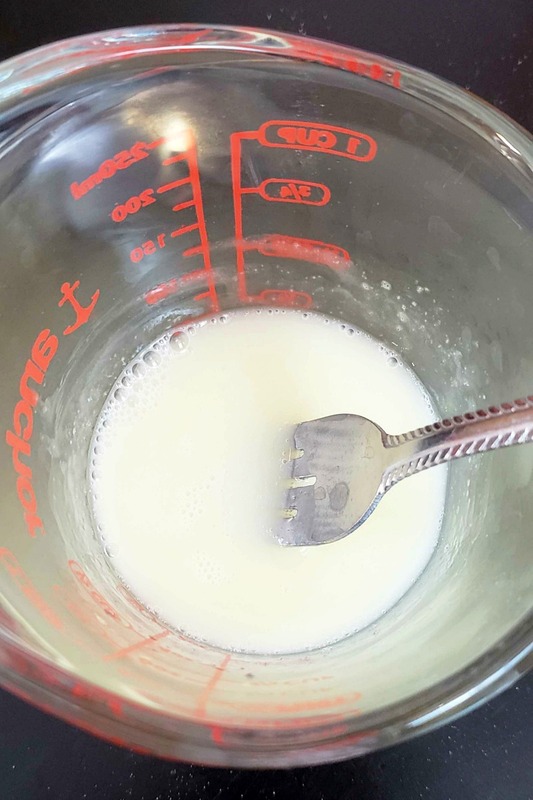 Put the castile soap, sweet almond oil and essential oils into a small mixing bowl or measuring cup and whisk to combine. If using soap coloring instead of mica powder, add that here. Carefully, pour the soap and oil mixture into the bowl with the dry ingredients. Gently stir to combine. It will bubble up, but do your best to stir as gently as possible. Once it’s well combined, dump it out onto a parchment paper lined cookie sheet to dry. I would suggest dividing it up between two cookie sheets to speed the drying process. It took a few days for mine to dry on one cookie sheet. 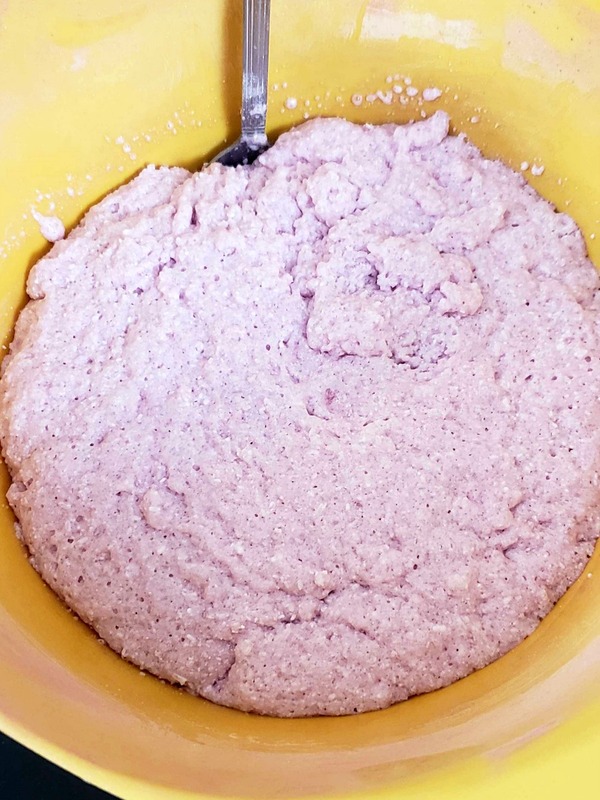 As your fizzing bath salts mixture begins to dry, you can break it up into smaller and smaller pieces to help it dry faster. 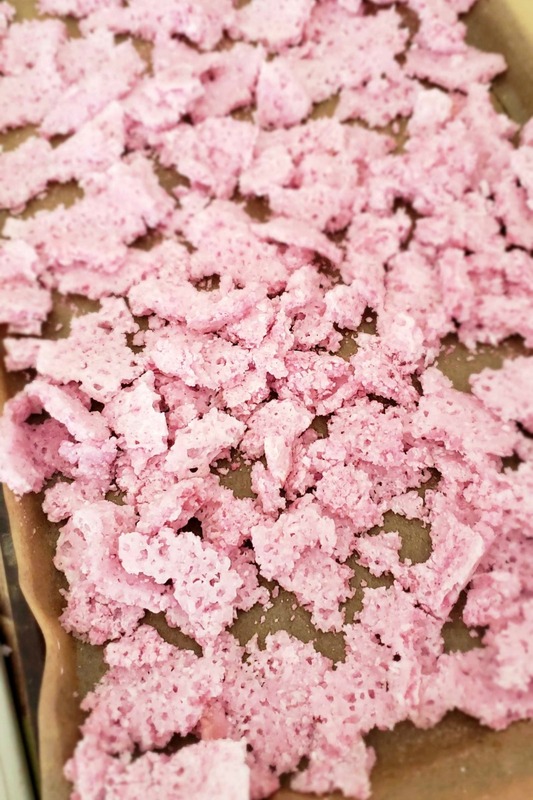 Once it’s completely dry, transfer it to a mixing bowl and use a meat tenderizer or potato masher to break the clumps into smaller pieces that resemble Pop Rocks candy. As long as the mixture is completely dry, you can transfer it to mason jars for storage. 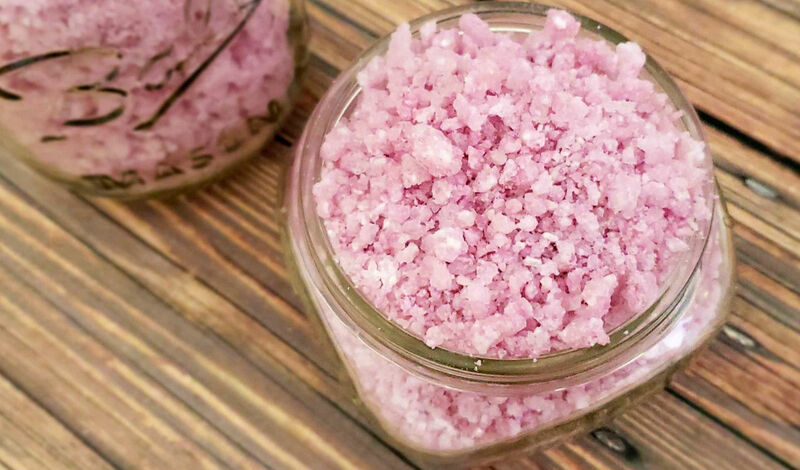 This recipe makes about two pints (or four 8-ounce jars) of Pop Rocks fizzing bath salts. Add 1/2 to 1 cup of your Pop Rocks fizzing bath salts to your bath water. I hope you and anyone you gift them to will enjoy my creation of Pop Rocks fizzing bath salts. What other scents and colors did you use for your Pop Rocks fizzing bath salts? This looks like a ton of fun for my kiddos! 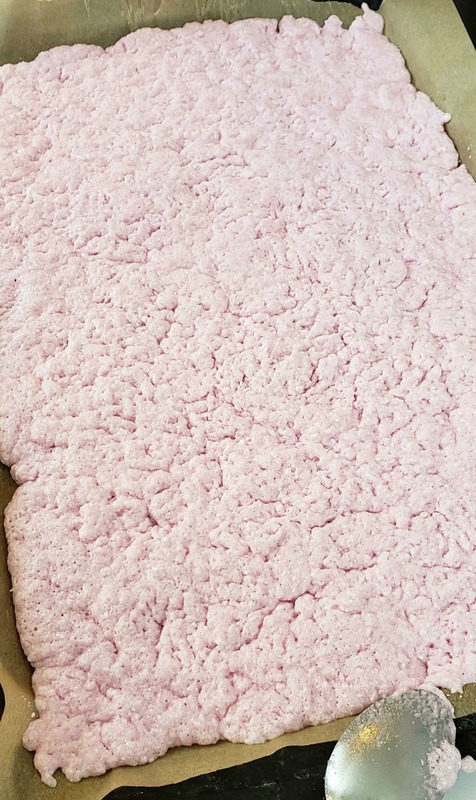 Is the castle soap strictly a binder…to make the baking soda and Citric acid stick to the Epsom salt? Could I use something like glycerine instead? I haven’t tried making it with glycerine instead. I’m not sure if that would bind everything the same way that the castile soap does. I also like the castile soap because I feel like it counteracts the slickness of the mica powder in the tub a little bit. I haven’t heard of that happening, but yikes that would be scary! Do you think grape seed oil could be used instead of sweet almond? It will puff up, but if it’s too puffy, it usually means you mixed it too aggressively. Just let it sit and dry and the puffiness should go down if it wasn’t overmixed. Would polysorbate be a good idea to help disperse the mica & oils or do you think that would effect the mixture? That’s not an ingredient that I have worked with so I don’t have any experience with it.